HiLine is an established external building cleaning, building painting and high level maintenance company based in Bedfordshire, just 60 miles from London, operating throughout the UK and into Europe. With many years of practical experience behind us, diversifying our skills to suit challenging situations and environments, HiLine has become a leading force in commercial, industrial building cleaning, painting, refurbishment and maintenance. 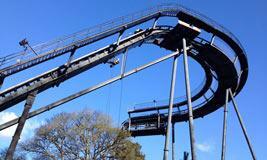 Rope access is deployed as required in addition to using familiar access equipment such as cherry pickers. Our trained, professional abseiling teams are qualified and safe, whether undertaking an external or internal renovation and restoration. 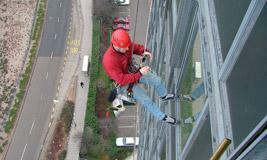 We are high level window cleaners and often work on some of the tallest buildings in the UK. We also offer dust removal, roof repairs and weather sealing, in addition to shrink wrapping for containment, convenience and safety. 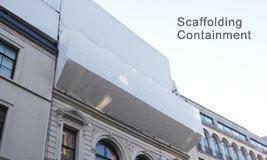 Why use scaffolding, when we can access areas of your building with minimum disruption to daily activities and staff. Contracts undertaken by HiLine Abseiling Ltd are comprehensively covered under the company's Employee and Public liability insurance. Delicate structures, listed buildings. Hiline can advise on efficient methods. Including brickwork re-pointing on new and old buildings. 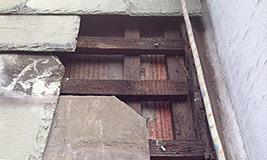 Building repairs including lead flashing, roofs, guttering, extractors, gullies, drainage channels, complete weather proofing. 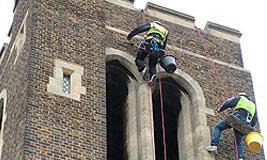 Hiline have cleaned windows on some of the tallest buildings in the UK. We are Commercial window cleaning experts, with efficient teams. 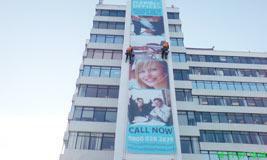 We install advertising banners and signs on large buildings. Abseiling allows us to go almost anywhere with minimum disturbance. Part of the pre-season renovation at a large leisure park, Hiline were employed for a second time to refurbish and paint steelwork. Ideal scaffolding containment on bridges and commercial structures, making them safe by controlling debris and cleaning solutions.